Famous and much-loved Lancashire pie manufacturer Holland’s was established in 1851 and has a reputation for baking excellence in addition to a wicked sense of humour. I worked on the Holland’s account for several years whilst at Principles Agency and created this poster campaign that drew on the brand’s history and nostalgia. There were multiple executions in this campaign and it received industry recognition by winning a Roses Creative Award. 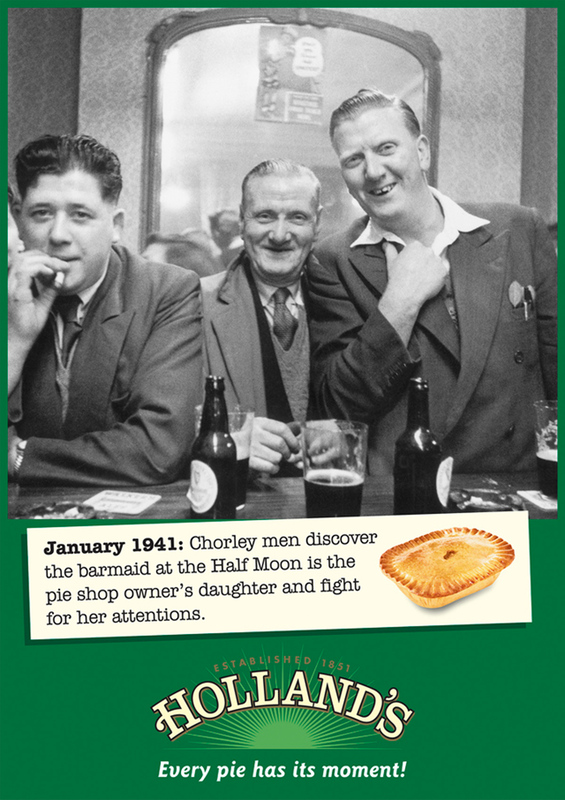 January 1941: Chorley men discover the barmaid at the Half Moon is the pie shop owner’s daughter and fight for her attentions. Holland’s. Every pie has its moment.